Unfortunately most of us know of the impending doom amphibians seem to be facing. For those of us who do not, here is a sample of the doom which we as individuals can help change for them. A major cause of amphibian declines worldwide is habitat destruction or alteration. Most experts in the field of amphibian conservation now agree that one of the major causes for amphibian decline globally is habitat loss. Urbanisation is very bad news for amphibians as it predominately involves major drainage works and the laying of concrete over former habitat; two things which amphibians cannot cope with or survive in. In Europe amphibian declines became acute in the 1960’s which was a lot earlier than most other parts of the world. This is in part due to the good fortune of Europe being rich and the most developed continent on earth. Unfortunately this was terrible news for the continents amphibian species, nearly all of which are under threat and populations are dropping either slowly or dramatically. Luckily for amphibians, a high level of development in the EU also comes with a high level of education and awareness within the general public. This heightened awareness seems to be recognising the plight of amphibians and finding innovative ways to both study and enjoy the presence of amphibians, and help stabilise their populations. 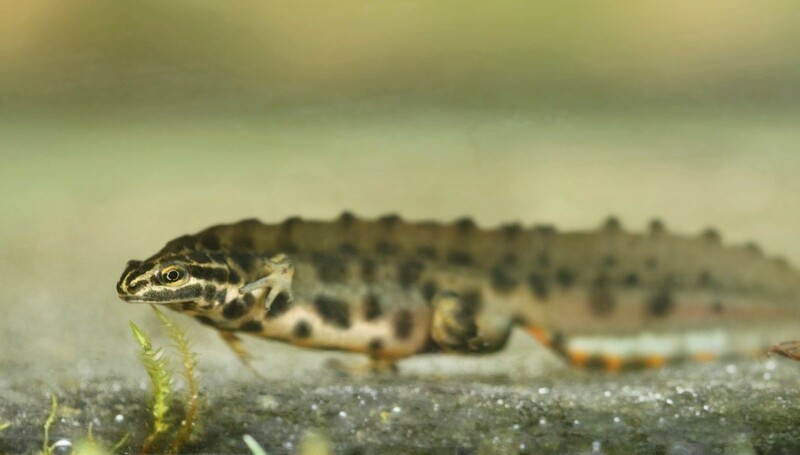 All three native species of amphibian in Ireland (common frog, smooth newt and natterjack toad) depend on small still water bodies to reproduce, lay eggs and for larval development. Due to urbanisation and extensive road network the populations of common frog and smooth newt are becoming more and more isolated and restricted in movement, even if the numbers appear stable. This article will focus on both the common frog and smooth newt as they have a nationwide distribution, whereas the natterjack toad is restricted to two locations, in Co. Kerry and Co. Wexford, although most of what is said in this article can still apply to the natterjack. Isolation makes local populations prone to fluctuate rapidly. Before fragmentation caused by urbanisation this was less of a problem for local populations. Populations could quickly “bounce” back to more stable levels due to migration from surrounding areas. Nowadays with more and more drainage and more roads this is no longer the case. Professor Tim Halliday, the director of The Declining Amphibian Population Taskforce (DAPTF) in the UK, has recommended the building of ponds in people’s gardens in both urban and rural settings. Professor Halliday has stressed that the pond should be built close to an existing population of amphibians to create the best effect. It is a lot easier than most people think. The benefits to amphibians can be incredible compared to the little effort and cost that goes into constructing an amphibian friendly pond which is also aesthetically pleasing. From personal experience I constructed a network of three ponds in my front garden back in 2007 with the sole purpose of helping support the local common frog and smooth newt populations in the area. I maintain this pond system to this day and I have to say when I am home it is one of the most rewarding ways to spend my time. Today with large stable populations of both newts and frogs in the garden our areas population of slugs flies and other pest insects like midges is far lower as they are the main prey items for newts and frogs. The number of hedgehogs has also gone up as they feed on recently metamorphed froglets and newts. Both frogs and newts are in the lower middle area of the web or food network within a habitat and so stable numbers help reduce pest species and they themselves become an important dietary component of more iconic larger species. The first thing I thought about before digging in my ponds was the best location to do so. Most people tend to forget that the terrestrial environment is just as important to newts and frogs as the aquatic one. For their first 2 years after morphing into adults, newts and frogs will not breed and spend all their time on land foraging and feeding. I picked my site because it was in a shaded, secluded area of the garden and on three sides was surrounded by dense plant growth and a large tree line which bordered the boundary into another field. I didn’t stock the pond with fish which is one of the most important things to remember as all fish species regardless of feeding or nativity will still prey on newt and frog eggs and larvae. Another important factor to consider is to not use a lawnmower within 2 meters of the pond banks. This creates a high meadow of grass which juvenile newts and frogs will use as a “buffer zone” in their first few weeks of getting used to terrestrial life. The buffer zone also provides excellent camouflage from predators and a feeding ground full of insects for them. For the first two years of my ponds life there were only frogs present; no newts. I was given advice by a friend of mine who had newts in his pond to remove large areas of reeds and add more lilies as well as the native submerged aquatic plant spiked water-milfoil (Myriophyllum spicatum). Within months of adding spiked water-milfoil I had smooth newts in the pond. It must be noted that although spiked water-mifoil is a native species it does grow rapidly and can completely outgrow and choke up a small area killing other plants also. So measures to control it each autumn must be conducted. I normally rake out gently about 1/3 of the growth in mid or late October to compost. It is done in autumn making sure all larvae has developed and left the pond and the same for adults. I believe the male smooth newt during the breeding season of March to July is one of our most stunning native vertebrates. They also have an elaborate mating ritual which is magnificent to witness. When they have located a female they stay in front of her not letting her pass and do a sort of “dance” to dazzle her with their large spinal and tail crest whilst also reaching for her with their forelimbs. The experience on a warm summer’s night listening to frogs croaking during their mating ritual is almost tropical in nature. When scanning the pond surface with a torch at night you can almost imagine you are conducting a crocodile or caiman count in Africa or South America with the dozens of eye reflections peering back at you. Sitting by the pond bank you sometimes see through the clear shallow water a male smooth newt conducting his courtship display in front of a female. This year has been the best year on record for my pond for juvenile smooth newts, which I am delighted about! Check out the video of some juveniles I temporarily captured and added to a aquarium for viewing and to examine in particular their incredible fan gills either side of them which is completely different to the regular common frog tadpole most people encounter. This video could surprise some people that these animals are actually native and need our protection through pond building! Hope you enjoy the video. An excellent website for further research into how water gardening can be amphibian friendly is the UK herpetology charity Froglife. Please follow the link and search for their water gardening guidelines.